When our Mum, who works for Discovery Campervans, told us we were going on a road trip in a 6 Berth campervan, we were extremely excited! This would be a new experience for us as previous holidays were generally spent in apartments with the odd camping holiday. 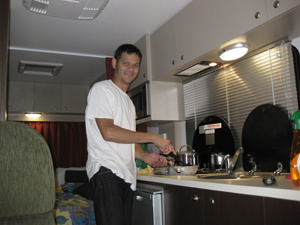 We all agreed however that the camper was heaps of fun even though we only had 6 days. Our holiday started off by Mum and Dad going to collect the 6 Berth vehicle from the Maui depot in Brisbane which was located near the Airport. They said the process was very easy, with the friendly staff showing them through the vehicle and explaining how all the features worked. It took about half an hour for them to complete the paper work and be on their way. When the van arrived at our house my brother and I were amazed to see that it took up the whole length of our driveway, but dad said despite its size, it was easy to drive. We decided not to use the dining table at the back of the vehicle and instead made up the bed and stored our baggage underneath. We opted for soft type bags as much easier to store than suitcases. Items to be kept cold were placed in the fridge and then we were ready to hit the road. Mum and Dad sat up front in the drivers cab whilst my brother and I sat just behind them at the 2nd table which had seatbelts for 4 people. We had plenty to keep us amused and the time passed really quickly. 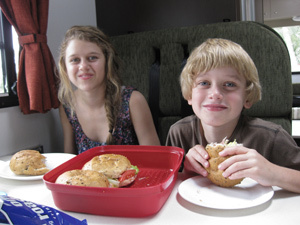 Our first stop was Ballina for some lunch where we pulled over in a rest-stop which had picnic, barbeque and toilet facilities, but the convenience of having your own toilet onboard was a bonus. We ate the sandwiches which mum had made at home, stretched our legs and then set off again. 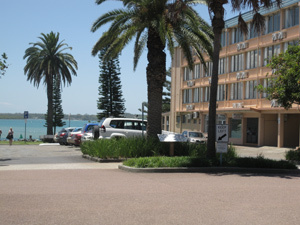 We travelled onto Port Macquarie where we spent our first night in a Top Ten Tourist park. The maps and brochures that were given to us at the depot helped us to find and ring ahead to book in. Mum said this would not be advisable during peak periods i.e. school holidays, Easter and Christmas as you would have to book well in advance. It was after 7pm when we arrived so after a quick dinner, it was not long before we were all ready for bed. We had to use the caravan park showers as the water hose supplied was not long enough to reach the water tank filling point. We would recommend that you check the hose connectors before you set off. The next morning after breakfast, Dad wound up the awning, unplugged the electricity and grey water pipe and we were on the road again by 9.00am. 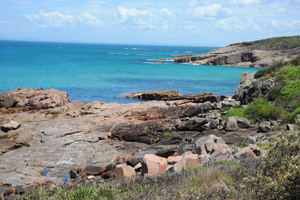 Our next port of call was Port Stephens a beautiful beachside town located about half an hour from Newcastle. We visited many beautiful beaches, the most memorable being Birubi Beach at Anna Bay which reminded us of an Egyptian desert, with pyramid shaped cement blocks. 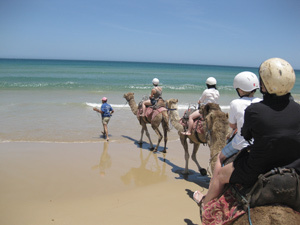 The highlight here was a camel ride across the sand and through the water, which was an awesome experience but a bit smelly and scary too! 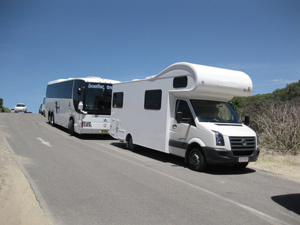 With the size of the campervan we had to park it in a bus zone!!! There were no parks for campervans. So please check parking signage carefully!!! Port Stephens is made up of small beachside towns and coves which meant parking the van was sometimes a challenge as we had to take up to 2 spots or park in bus zones, but the spectacular scenery was well worth it. We left early afternoon to travel to Newcastle and then on to the Hunter Valley where we had pre-booked 2 nights at the Big 4 Holiday Park. 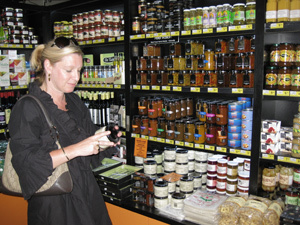 We had time to visit the smelly cheese factory-which had a lot of different cheeses, olives, vinegars, wines, ice-creams and chocolates. Mum was in her element and bought some nice treats for us (chocolates, ice-cream and fruits). 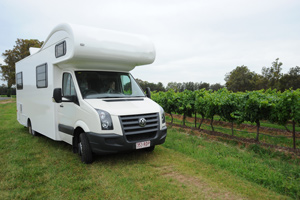 Our parents later enjoyed cheese and wine with our neighbouring campers from Holland who had hired a Britz Renegade vehicle. The next day we visited more wineries and some more wineries � a bit boring for my brother and I - we were looking forward to going back to the caravan park for a swim as it was very hot. Last stop before campsite was a of boutique shopping village that had clothing, homemade chocolate, book store, restaurants and a golf driving range. Heaps of garden areas for us to laze about and enjoy the atmosphere. They also have open air concerts and special events held throughout the year. From the Hunter Valley we headed back to Port Macquarie as we enjoyed our first night here so much.This time we stayed in a caravan park which was directly on the beach. After a gorgeous seafood dinner and a walk on the beach it was bedtime for the last time in the camper! We were up early the next day as we had quite a long drive ahead of us back to Brisbane. Dad had to have the van back to the depot before closing time at 4.00pm. It was just as well we did leave early as with road works it took us longer than expected. We all had a fantastic time and would definitely hire a campervan again.